President Barack Obama today signed the wide-ranging $6 billion 21st Century Cures Act into law, a week after it passed by overwhelming margins in both the House of Representatives and Senate. The law includes significant mental health components. The president thanked Democrats and Republicans who had worked together on the legislation. 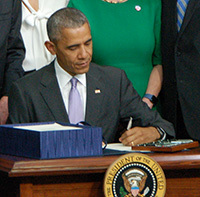 Among other provisions, the law will increase coordination among federal agencies responsible for treating mental illness by establishing medical leadership in the Substance Abuse and Mental Health Services Administration, improving how the federal government finances and manages evidence-based mental health services, promoting workforce development and integrated care, and strengthening enforcement of parity.